Hunger and undernourishment are an unfortunate reality for approximately 795 million people around the world. Researchers can help to meet these nutritional needs by producing genetically engineered staple crops with increased amounts of essential vitamins and minerals. 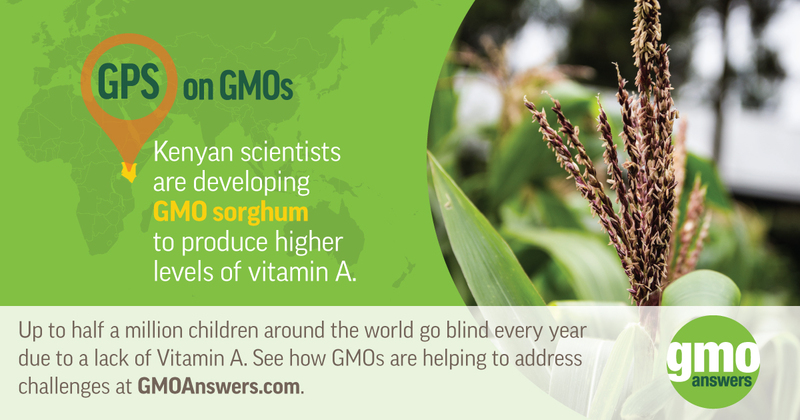 Vitamin A deficiency (VAD) is a leading cause of acquired blindness in the developing world. Each year up to 500,000 children become blind because of VAD, and approximately half of those children will die within one year of going blind. Rice is a staple food for more than half of the world’s population and accounts for between 30-72% of the energy intake across Asia alone. Genetically modified “Golden Rice,” under development at the International Rice Research Institute (IRRI), is a nutritionally enhanced crop that could help to alleviate VAD. 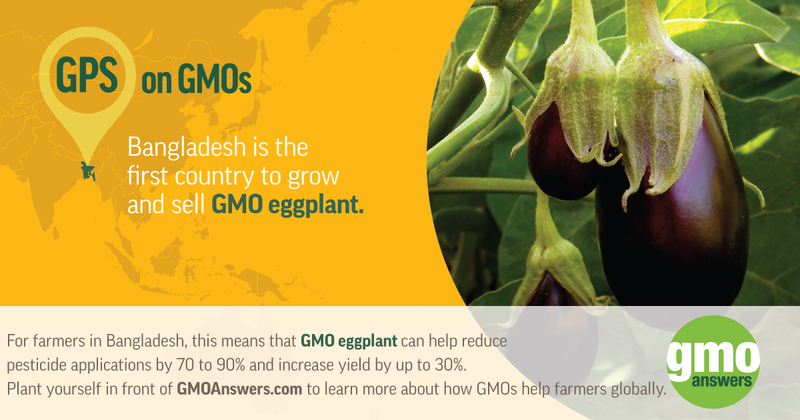 Golden Rice is genetically engineered to provide an increased amount of beta-carotene, a precursor of vitamin A. One serving of Golden Rice could provide half the required daily intake of pro-vitamin A for a one to three year old child. Currently, IRRI, working with national research organizations in Bangladesh, Indonesia and Philippines, has been conducting field trials and analyzing data in preparation for product approval applications. Iron and zinc deficiencies are prevalent throughout developing nations, significantly impairing individual’s physical health and community economic well-being. Iron is an essential mineral for good health, important for cellular functions and transporting oxygen throughout the body. According to the World Health Organization (WHO) iron deficiency affects more people globally than any other condition. Iron deficiency can negatively affect an individual’s physical and cognitive development, as well as reduce economic progress in an impacted community through decreased work output. Another key mineral, zinc, is required for cellular development, protein synthesis and a healthy immune system. A lack of zinc can result in impaired growth and severely weakened immune defense. The WHO estimates that about one-third of the global population is affected by zinc deficiency. Sorghum is an important staple food, like rice, that can be nutritionally improved to address iron, zinc and Vitamin A deficiencies. Sorghum, which originated in Africa, is a principal food for 300 million people on the continent, and approximately 70 percent of all sorghum globally is grown in Africa. Sorghum is unique and particularly well-suited for Africa because it can tolerate heat and drought, as well as periods with too much water, making it possible to cultivate in both dry and sub-tropical regions. Through the Africa Biofortified Sorghum Project (ABS), an international public-private partnership, researchers have demonstrated that biotechnology can be used to enhance the bioavailability of iron and zinc, increase the amount and stability of pro vitamin A (such as beta- Carotene), and improve the protein digestibility of sorghum. ABS research and development continues, with field trials being conducted in Kenya, Nigeria and the U.S. Many may think of bananas as their source of post-workout potassium or a key ingredient for the dessert bananas Foster. However, across Africa and Asia, plantains, also known as “cooking bananas,” provide a primary source of calories for 450 million people. The Banana21 initiative, a public-private partnership funded by the Gates Foundation, is working to develop a genetically engineered cooking banana with a three-fold increase in iron and a four-fold increase of pro-vitamin A. To date, field trials have been conducted in Australia and Uganda. And, like the cassava, Banana21 researchers are looking to find a solution to plant diseases and viruses that infect bananas, such as Fusarium wilt, in addition to improving the bananas’ nutrient content.